Did you make any money-related New Year resolutions this year? Perhaps to start a regular savings habit, to pay off your credit card, to get ahead on your home loan? How are those resolutions going? If you haven’t thought about them since mid-January (which is the case for many of us) then Easter is a great time to give your money matters another kickstart. So for those who have a few hours to spare over the Easter long weekend, here are a few tips. It’s difficult to track where your money is going if your home office or filing tray is a mess. According to a number of surveys, clutter and mess affects both our mood and our productivity. It makes sense, really! So invest a few hours in organising your paperwork and it could help you to feel a lot more in control. Sure you might have a budget, but do you actually follow it? A budget is worthless unless you treat it as an instruction manual rather than a sci-fi novel. There are plenty of good online budget calculators out there – the Sorted website has a great one here. Whether it’s your credit card that costs a bomb or takeaway food that you didn’t need to buy, knowing where your money is being spent helps you find ways to save. Yes, Christmas is still many months away, but I’m sure there’s something you’d love to do over those holidays if you could afford it. So calculate how much that will cost, divide it by 37 weeks – and start saving. Sometimes you just need to do it! 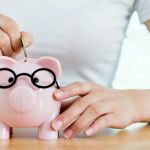 These things are always easier said than done, so if you need some help in sticking to your money goals, try this article on three ways to make your resolutions stick.